LG has finally launched its Optimus G smartphone in the Indian market. The phone boasts of a quad-core processor, and a 13-megapixel camera, among other specifications that make it the company's flagship phone in the Indian market, at least till it launches the Optimus G Pro. Although the launch is little late compared to other regions, we try to find out if the Optimus G will enable LG to gain a foothold in the Indian smartphone market. Our review unit was the black coloured variant of the phone. 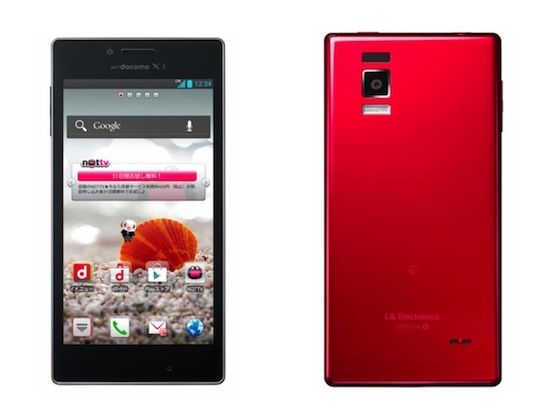 The first thing that we noticed about the LG Optimus G was its industrial design. While it looks like a large rectangular brick from distance, the phone exudes a premium feel and finish with its clean edges, a shiny black front, and a Nexus 4-like glass back with more or less the same crystal pattern. The front and back of the phone are layered with Corning Gorilla Glass 2 making them durable, and comparatively more resistant to scratches. The phone has a unibody design so there's no removable cover at the back. It has rounded corners. The phone weighs 145 grams and feels a little heavy. The front is all glass with no hardware buttons, dominated mainly by the 4.7-inch display. There are three capacitive buttons for navigating through the interface below the screen, while the lens of the front camera is located above the screen towards the right side along with a notification LED light, with the LG branding at the middle and sensors towards the left. The earpiece is located at the top, bang in the middle. A really thin chrome frame contours the screen, while there's another chrome layer visible in the middle when you are looking at the phone from sides. The back is made of glass with a crystal pattern. LG has used premium quality materials in the phone that is evident once you take a closer look. The back also features a rectangular camera lens that is also braced by a chrome frame, with the flash located just below it. There's LG branding towards the upper part of the back, and a small speaker grill towards the lower part. The power button is located on the right side of the phone, while the volume rocker sits at the left side. Both these controls offer good tactile feedback and follow the same black and chrome colour scheme. The SIM card tray is also located on the left side along with a pin-hole to eject it. The bottom edge has a micro-USB port and a microphone, while the 3.5mm headset jack sits on the top along with a secondary microphone for noise cancellation. The LG Optimus G sports a 4.7-inch IPS+ display that has a resolution of 1280x768 pixels and a pixel density of 320ppi. The screen is bright and vivid, and text looks crisp while app icons and images look sharp. Our only gripe was that the screen was highly reflective affecting sunlight legibility. The viewing angles were good thanks to the IPS+ display, and colour rendering was accurate. The LG Optimus G sports a 13-megapixel rear camera with auto focus and face tracking. It can also take pictures with voice commands like 'cheese', 'kimchi', 'LG', 'Smile' and 'Whisky'. The camera also supports a time catch shots mode which starts taking pictures even before the trigger is pressed and displays 5 best shots till that time. The camera UI includes a customisable quick menu which features controls for enabling voice commands, time catch shots, switching between Normal, HDR, Panorama and Continuos shot modes, and for tweaking other settings (including settings for Focus, Zoom, brightness, image size, scene modes, ISO, white balance, colour effects, timer, geotagging, shutter sound, auto review). As we mentioned, the quick menu can be customised selecting any of the settings options as the ones displayed in the menu. The continuous mode takes six continuous pictures at a time. The camera app also offers a shortcut to the gallery. It offers 8X zoom, which can be controlled by pinching in and out. The volume buttons also double up as shutter keys when you're in the app, although there is a virtual shutter key as well. The phone takes good quality pictures and we found that the colour rendering was pretty accurate. At times the images miss out on fine details, but you won't notice it with casual use. The phone is capable of shooting full-HD videos with a frame rate of 30 frames per second. You can also take still photos while shooting videos. In our tests we were satisfied with the quality of videos shot with the phone. The LG Optimus G runs Android 4.1.2 Jelly Bean and LG has added its own Optimus UI layer on top, majorly changing the look and feel of the interface and enabling users to customise the phone. LG also adds several tweaks including Smart Screen that keeps the screen on if the phone detects the user's eyes looking at it - a feature we first saw in the Samsung Galaxy S III. LG also allows users to choose the phone's default font and font size, change how long the capacitive keys backlight stays on, and customise the events that trigger the notification light to flash. You can select from 4 different visual themes, each with a different icon set, home screen wallpaper and app drawer background. You can have up to 7 screens that can be populated with widgets and app shortcuts. LG even allows you to choose between various animation effects when you swipe from one home screen to another or when you unlock the phone. We're glad that LG has placed the Back button on the left side in line with the Nexus phones. The Home button doubles up as the task switcher on long press. The contextual Menu button offers various settings when pressed in the home screen mode, and invokes Google Now on long press. LG has also skinned the notification tray including toggles for various settings including for sound, data, NFC, Bluetooth, Wi-Fi, and Hotspot among others. It also features shortcuts for invoking QSlide apps, and a control for changing screen brightness. As we mentioned, the phone comes with a 4.7-inch display, and LG has included some additional features to make use of the screen real estate. Firstly, there are special apps that LG likes to call QSlide apps. These include a web browser, Memo pad, Calendar, Calculator and a Video player. Users can run two of these QSlide apps simultaneously and there's a slider that allows you to focus on one of them. This is similar to what Samsung introduced with some of its devices including the Galaxy Note II. LG also offers a QuickMemo app that lets users scribble notes on a blank page or on top of a screen shot. The app also has an overlay mode allowing you to take notes while running another app. We're not sure if people with big hands will find it useful as LG doesn't offer a Stylus with the phone. Talking of apps, the phone includes additional ones for Backup, Cell Broadcast, File Manager, File sharing, a Dictionary, a Memo app, a Notebook app, Polaris Office 4, a Quick Translator app, LG's service related apps, LG's own app store (SmartWorld), a Task Manager, and apps for video editing. The phone also allows streaming content to other devices via the DLNA protocol. The home screen also features a landscape mode, and some of the apps, including LG's email app make use of it by offering a preview pane for emails in that mode. In addition to all of these, the phone brings standard Jelly Bean functionality. Overall, LG has tried to make the phone as different from stock Android, as possible. While that may delight some, 'stock-Android' fans will be far from impressed. The LG Optimus G is powered by a 1.5GHz Qualcomm S4 Pro quad-core processor with 2GB RAM onboard, and an Adreno 320 chip (400 MHz) for processing graphics. There is 32GB of internal storage, out of which 25GB is available to the user. Unfortunately, the phone doesn't offer a memory card slot for expanding the memory. With Android 4.1 Jelly Bean, the overall experience of navigation through the interface was extremely impressive, thanks to Project Butter and all the power under the hood. We did not experience any lag at all while launching apps, playing games, scrolling web pages or switching between apps. We were able to run all video formats including AVI and MOV through the native video player, and HD videos played without a hitch. The speaker on the phone delivers good quality sound at high volume levels but sound gets muffled when the phone lies on its back as the speaker is located on that side. The phone also supports Dolby audio when you plug-in the headphones, which offers a much richer sound. The Optimus G offers Chrome in addition to the default browser. The default browser does not feature Adobe flash for viewing Flash content. Call quality was mostly good barring a few instances when we tried to use the phone in low signal zone. The phone comes with a 2100mAh battery, and in our usage, it lasted us a full day with medium usage, including 1-1.5 hours of phone calls, two e-mail accounts with push notifications, playing some music, Twitter notifications and WhatsApp chats. It's worth pointing out that we had turned off Wi-Fi and auto-brightness, and the phone was hooked to a 3G network with the screen brightness at the highest level. Altering these settings might help in running the phone for a longer duration, depending on your usage pattern. The phone also offers an Eco mode to optimise processor control to (theoretically) extend battery life. The phone also includes NFC capabilities, and we were able to transfer and receive files through Android Beam, which combines Bluetooth and NFC for sharing data. The LG Optimus G comes to India at a time when LG has already released the Optimus G Pro in other market. LG Optimus G Pro features a 5.5-inch screen and a faster processor but we feel that not all users would be interested in a 5-inch+ phone (phablet). It's also worth pointing out that LG has not been able to establish itself in the Android smartphone category of late, with Samsung ruling the Indian market. In fact, the Samsung Galaxy S III, which is also powered by a quad-core processor is the phone's closest competitor, and is very popular in the Indian market, selling at a price of Rs. 28,000- Rs. 29,500 depending on the retailer. The Galaxy S III has a removable battery and a memory card slot to expand memory but an inferior plasticky build. The LG Optimus G, on the other hand is based on a newer chipset, has a higher resolution camera and more RAM. The phone is available online for Rs. 30,990. The HTC One X is another competitor in the same processor, albeit with less RAM and a lower capacity battery. We would recommend the LG Optimus G to anyone looking for a feature rich Android smartphone over other offerings.